The Pittsburgh Allegheny Sports and Exhibition Authority received a $5 million grant on Feb. 11 to start working on the former site of the Civic Arena. The grant is a part of Gov. Tom Corbett’s Redevelopment Assistance Capital Program and comes nearly a year after the Civic Arena was demolished. It will allow the SEA to begin constructing a street grid, public utilities and general infrastructure work in the 18-acre piece of land, SEA Executive Director Mary Conturo said. The project will cost an estimated $40 million. The SEA originally requested $15 million from the state, but Conturo said they are “very excited” to be able to initiate the first phase of infrastructure. The Urban Redevelopment Authority and the Stadium Authority of the City of Pittsburgh currently own the land, Conturo said. The Pittsburgh Penguins, who own the rights to develop the land and construct the buildings, are discussing the idea of a mixed use development with housing, retail and commercial space. The Penguins failed to return several phone calls from The Duke. Robert Rubinstein, URA director of economic development, said the Penguins’ current plans for development will put the land to its best use, and that he is “anxiously waiting” for the project to start. “It’s one of the most contractive opportunities in the country being that close in proximity to a central business district,” Rubinstein said. Although the Penguins have the rights to develop the area, there are conditions stipulating that the team must follow URA and SEA guidelines, Rubinstein said. The guidelines were decided upon by the three groups during negotiations to keep the Penguins in town in 2007. Once the Penguins finalize their plans and specifications, both the URA and SEA have the oversight to review and accept the proposal. The URA is currently awaiting a proposal from the Penguins identifying who their development partners will be, Rubinstein said. Conturo said that to obtain the remaining funds necessary to complete the project, the SEA is reaching out to urban redevelopment, green infrastructure and transportation groups. She also acknowledged the possibility of larger grants like the one from the RACP. “We have been looking at available sources through state funding programs and federal funding programs,” Conturo said. The SEA is planning to begin the first phase of infrastructure work in July, Conturo said. They will start their utility and road work at the area at the top of the hill closest to the Hill District. 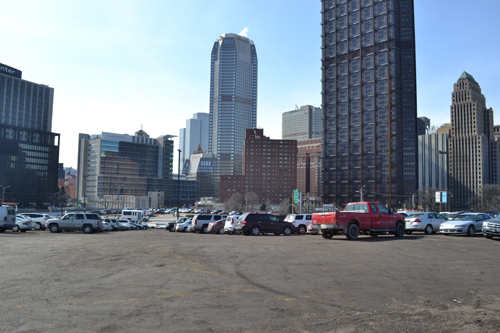 The Pittsburgh Allegheny Sports and Exhibition Authority received a $5 million grant on Feb. 11 to put towards redevelopment at the former site of the Civic Arena. One Response to "Former Civic Arena site receives grant"